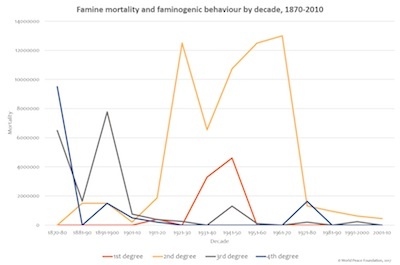 The Famine Trends dataset includes two kinds of overlapping events, which have hitherto largely been studied separately. One set of events is great and catastrophic famines. A famine is defined as a food crisis that causes elevated mortality over a specific period of time. 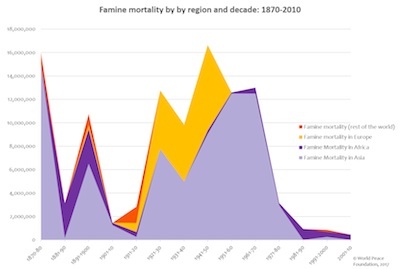 Using the criteria developed by Stephen Devereux (Devereux 2000) for ‘great famines’ (100,000 or more excess deaths) and ‘catastrophic famines’ (one million or more excess deaths), it includes any famine for which the upper estimate of excess deaths falls above 100,000. Using the four-point scale for ‘famine crimes’ developed by David Marcus (Marcus 2003), it also includes episodes of mass intentional starvation. For these events, the threshold is 10,000 deaths by starvation for inclusion in the listing. 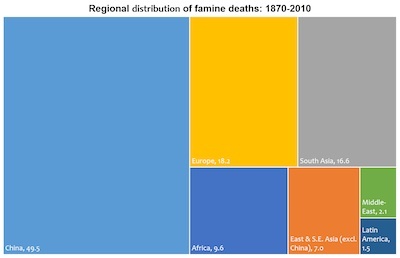 However, only events of mass intentional starvation that caused over 100,000 deaths are included in the quantitative dataset, on which the graphs are based. For more discussion of the data, see Alex de Waal, “Armed Conflict and the Challenge of Hunger: Is an End in Sight?” in The 2015 Global Hunger Index (Welthungerhilfe, International Food Policy Research Institute, and Concern Worldwide). 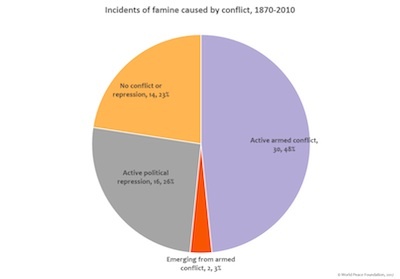 See also de Waal’s posts on famine on the WPF blog, Reinventing Peace. His publication Mass Starvation: The History and Future of Famine (Polity Books, Fall 2017 [UK] Winter 2018 [US]) is partially based on this dataset, and explores the history of modern famines: their causes, dimensions, and why they ended. 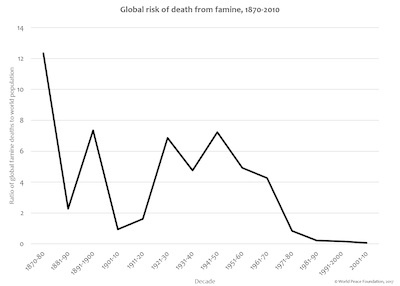 This graph plots worldwide famine mortality between 1870 and 2010, by decade. Famines and episodes of forcible mass starvation have killed 104.3 million people since 1870. The main trend, however, is downwards. In each decade between the 1870s and the 1970s, great famines killed between 1.45 million and 16.64 million, at an average of about 927,810 per year. The last calamitous famine was Cambodia in 1975-79. 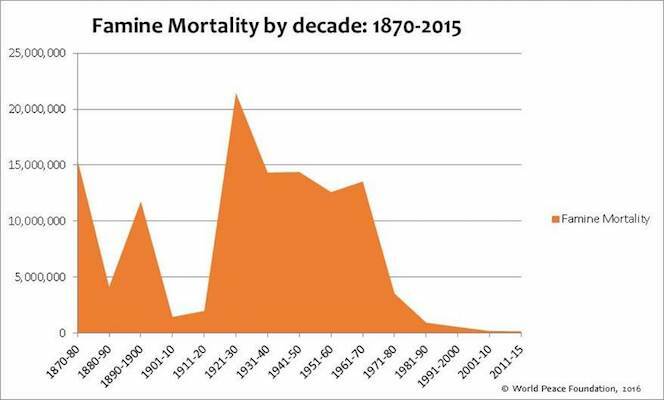 Since 1980, the annual death toll in great famines has averaged 75,217, or about 8 per cent of the historic level. Download a pdf version of this graph. 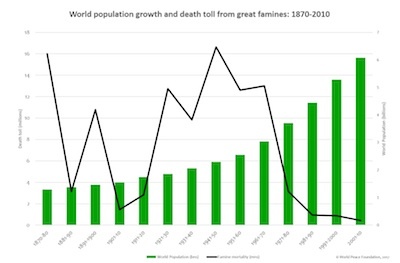 The decline in famines is inversely correlated with the growth in world population, from about 1.3 billion in 1870 to 7 billion today. The history of great famines can be classified into 4 broad periods: (a) famines of European colonialism (till about 1914); (b) the extended period of the world wars and accompanying mass starvation (from 1914 till about 1950); (c) famines caused by totalitarianism (including the famine caused by Mao Zedong’s Great Leap Forward), and (d) Decline and smaller famines and humanitarian crises since the 1970’s (primarily in sub-Saharan Africa). The geography of modern famine is overwhelmingly a story of Asia and eastern Europe, which account for 87.4 percent of famine deaths in the period. Approximately half of these (56.5 million) were in East and South-east Asia: mostly China but also Vietnam, Indonesia and Cambodia. South Asia accounted for a further 16.5 million. Europe including the USSR accounted for 18.17 million. African famine deaths during the entire period are estimated at 9.18 percent of the total, 9.575 million, most of them in the late nineteenth century, in Congo and north-east Africa. Latin America counted about 1.5 million famine deaths, all of them in Brazil in the nineteenth century. The Middle East has an estimated 2.07 million deaths, most associated with World War One and the Armenian genocide. This chart demonstrates the same information as above. 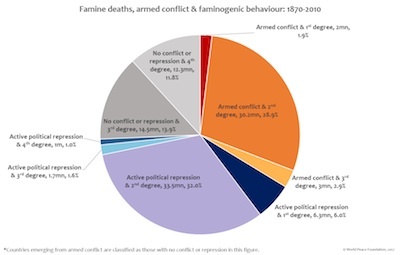 The vast majority of famine deaths were association with conflict or political repression. 35.2 million occurred in wartime, with a further 1.7 million in countries emerging from armed conflict. 42.43 million deaths occurred in famines under active political repression such as repressive colonial rule or dictatorship. A smaller number, 24.975 million deaths, was associated with neither. First degree famine crimes: Governments or other authorities that deliberately use famine as a tool of extermination or a means of forcing a population to submit to their control. These killed 8.3 million people, 7.9 percent. Second degree famine crimes: Public authorities pursue policies that are the principal cause of famine, and continue to pursue these policies even after becoming aware that they result in famine. These killed 63.7 million, 61 percent, in all continents except the Americas, and in every time period. Third degree of culpable famine causation: Public authorities are indifferent: their policies may not be the principal cause of famine, but they do little or nothing to alleviate hunger. These killed 19.1 million, 18.3 percent. Fourth degree or non-culpability: Incapable or incapacitated authorities, faced with food crises caused by external factors (climatic, economic, etc. ), are unable to respond effectively to needs. These killed 13.3 million, 12.8 percent. 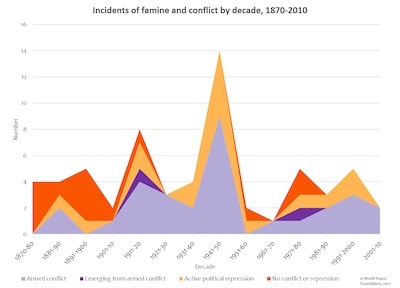 This graph disaggregates famine mortality, by plotting the number (and proportion) of deaths that took place during conditions of war and repression, and the faminogenic behavior of governments during that period. As expected, we find that first and second degree faminogenic acts only took place during war or political repression. 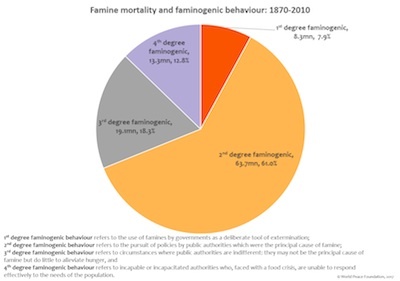 This graph disaggregates famine mortality attributable to the 4 degree of faminogenic behaviour, by decade. This graph plots the ratio of global mortality from great famines and the total population of the world, to formulate a very rough estimate of the risk of death from famine, on average, across the world. The trend is downwards, with a sharp decline after the 1960s. 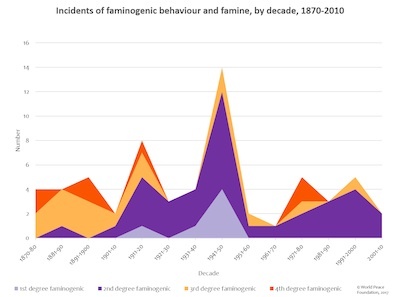 This graph plots the total incidents of 1st to 4th degree faminogenic acts between 1870-2010. In our catalog, more than half of all great famines (33 instances, or about 54.1 percent) were attributable to second degree faminogenic behaviour. 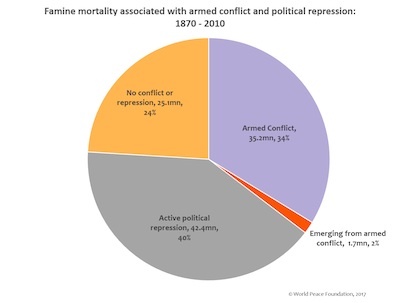 This graph plots (by decade) famines attributable to active armed conflict, political repression, occurring in countries emerging from armed conflict and in countries with no conflict or political repression. 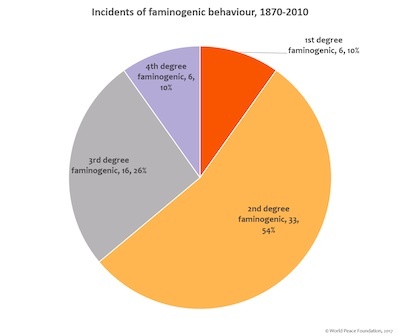 This graphs plots famines attributable to the different degrees of faminogenic behaviour (i.e. 1st – 4th degree) by decade. 1876-1879 China (Shanxi, Henan, Shandong, Zhili, and Shaanxi) Drought, lack of state capacity due to rebellion & colonialism 9m Edgerton-Tarpley, 2008; Fuller, 2015; Davis, 2002; Li, 2007. 1897-1901 China Drought, economic crisis, colonial warfare, internal rebellion 1m Mallory, 1926; Li, 2007; Esherick, 1987; Cohen, 1997. 1921-22 Russia Civil war 1m-10m (5m official) Lowe 2002; Patenaude 2002, pp. 196-8. Poland Death of residents of the Warsaw Ghetto from starvation 83,000 United States Holocaust Memorial Museum. 1991-1999 Iraq Sanctions, war and dictatorship 166,000-300,000 Garfield 1999; Ali and Shah 2000. 1998-2002 Democratic Republic of Congo War 290,500-5.4 million Roberts et al. 2000, 2001, 2003; Coghlan et al. 2006, 2007. 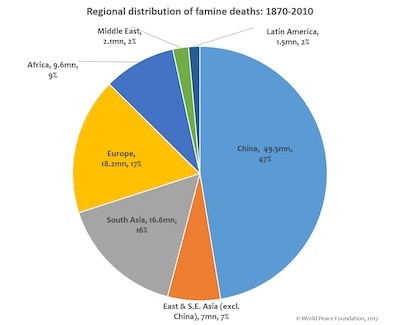 We note that a famine (caused by drought, floods and economic crisis) in Anhui and Jiangsu provinces of China is reported to have resulted in the deaths of 24 million people in 1907 (Kte’pi, 2011) but were unable to find any other sources to corroborate this. Consequently, we have not included this in our famine data. We do not include this in our dataset. We do not include this in our dataset, as the death toll may not have crossed 50,000. The ‘Hunger Plan’ includes all episodes of mass starvation associated with the Eastern Front 1941-5, including the starvation of Jews. The total numbers who died of starvation on account of the Hunger Plan and the Final Solution is undoubtedly well in excess of the total in these lines. Starvation deaths in the Warsaw Ghetto are included because it is classified within the Hunger Plan. We do not include this in our quantitative data. 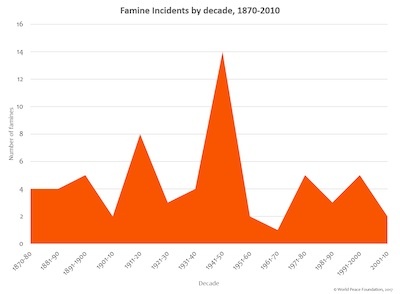 We generate our quantitative results on the basis of the episodes of famine between 1870-2010; as a consequence we do not include this episode in our quantitative dataset. Acherson, Neal, 1999. ‘The King Incorporated: Leopold the Second and the Congo. Cambridge, Granta (first published 1963). Afkhami, Amir, 2003. ‘Compromised Constitutions: The Iranian Experience with the 1918 Influenza Pandemic.’Bulletin of the History of Medicine 77(2): 367-392. Ali, Mohamed M., and Iqbal H. Shah, 2000, ‘Sanctions and childhood mortality in Iraq’, The Lancet, 355: 1851–57. Antonius, George. 1946. The Arab Awakening: The Story of the Arab National Movement. New York: Capricorn Books. Becker, Jasper. 1996. Hungry Ghosts: Mao’s Secret Famine. New York: The Free Press. Coghlan, Benjamin, Richard Brennan, Pascal Ngoy, David Dofara, Brad Otto, Mark Clements, and Tony Stewart, 2006. ‘Mortality in the Democratic Republic of Congo: a nationwide survey,’ The Lancet, 367: 44–51. Cohen, Paul A. 1997. History in three keys: The boxers as event, experience and myth. New York: Columbia University Press. Collingham, Lizzie, 2012. The Taste of War: World War II and the battle for food. New York: Penguin. Edgerton-Tarpley, Kathryn. 2008. Tears from Iron: Cultural Responses to Famine in Nineteenth-century China. Berkeley: University of California Press. Edwards, Dwight W. ed. 1922. The North China Famine of 1920-21 with special reference to the West Chihli Area: Being the report of the Peking United International Famine Relief Committee. Beijing: Commercial press works ltd.
Esherick, Paul. 1987. The origins of the Boxer uprising. Berkeley; London: University of California Press. Foran, John. 1989. ‘The Concept of Dependent Development as a Key to the Political Economy of Qajar Iran (1800-1925).’ Iranian Studies 22(2/3): 5-56. Fuller, Pierre. 2013. “North China Famine Revisited: Unsung Native Relief in the Warlord Era, 1920–1921.” Modern Asian Studies 47(3): 820–850. Fuller, Pierre. 2015. “Changing disaster relief regimes in China: an analysis using four famines between 1876 and 1962.” Disasters 39(S2): S146−S165. Garfield, Richard, 1999. ‘Morbidity and Mortality among Iraqi Children from 1990 to 1998: Assessing the impact of economic sanctions.’ Goshen, Indiana: Institute for International Peace Studies, Univ. of Notre Dame, and the Fourth Freedom Forum. Garnaut, Anthony. 2013. “A Quantitative Description of the Henan Famine of 1942.” Modern Asian Studies 47(6): 2007–2045. Hovannisian, Richard, 1971. The Republic of Armenia. Volume I: The first year, 1918-1919, Berkeley, University of California Press. Kévorkian, Raymond, 2011. The Armenian Genocide: A complete history, London, IB Tauris. Kte’pi, Bill. 2011. “Chinese Famine (1907).” In Encyclopedia of Disaster Relief, edited by K. Bradley Penuel and Matt Statler, 70-72. Thousand Oaks, CA: SAGE Publications, Inc. doi: http://dx.doi.org/10.4135/9781412994064.n31. Li, Lillian M. 2007. Fighting Famine in North China: State, Market and Environmental Decline, 1690s-1990s. Stanford: Stanford University Press. Lowe, Norman, 2002. Mastering Twentieth-Century Russian History. London, Palgrave. Mazurana, Dyan et al., 2014, Surveying Livelihoods, Service Delivery and Governance – Baseline Evidence from Uganda, London: Secure Livelihoods Research Consortium, at:http://securelivelihoods.org/publications_details.aspx?resourceid=295. Muscolino, Micah. 2015. The Ecology of War in China: Henan Province, the Yellow River, and Beyond, 1938-1950, Cambridge: Cambridge University Press. Ó Gráda, Cormac. 2008. “The ripple that drowns? Twentieth-century famines in china and India as economic history.” The Economic History Review 61:5-37. Ó Gráda, Cormac. 2009. Famine: A short history. Princeton, N.J: Princeton University Press. Okasaki, Shoko, 1986. ‘The Great Persian Famine of 1870-71,’ Bulletin of the School of Oriental and African Studies, 49.1, 183-92. Patenaude, Bertrand M. 2002. The Big Show in Bololand. The American Relief Expedition to Soviet Russia in the Famine of 1921. Stanford, Stanford University Press. Roberts, Les, 2000. Mortality in eastern DRC: results from five mortality surveys. New York, International Rescue Committee. Roberts, Les, Charles Hale, Fethi Belyakdoumi, Laura Cobey, Roselidah Ondeko, Michael Despines, John Keys. 2001. Mortality in Eastern Democratic Republic of Congo: Results from eleven mortality surveys. New York: International Rescue Committee. Roberts, Les, Pascal Ngoy, Colleen Mone Charles Lubula Luc Mwezse Mariana Zantop Michael Despines. 2003.Mortality in the Democratic Republic of Congo: Results from a Nationwide Survey. New York: International Rescue Committee. Schilcher, Linda. 1996. “Famine in Syria, 1915– 1918.” in Problems of the Middle East in Historical Perspective: Essays in Honour of Albert Hourani, edited by John P. Spagnolo and Albert Hourani, 241– 259. Reading: Ithaca Press.Schilcher, Linda Schatkowski, 1992. “The Famine of 1915-1918 in Greater Syria,” in John Spagnolo, ed.,Problems of the Modern Middle East in Historical Perspective. Reading, UK: Ithaca Press. Spoorenberg, Thomas and Daniel Schwekendiek, 2012. “Demographic Changes in North Korea: 1993-2008,”Population and Development Review, 38.1, 133-158. Suny, Ronald Grigor, 2015. ‘They Can Live in the Desert but Nowhere Else,’ A history of the Armenian Genocide, Princeton, Princeton University Press. United States Holocaust Memorial Museum, nd. ‘Warsaw.’ Holocaust Encyclopedia,https://www.ushmm.org/wlc/en/article.php?ModuleId=10005069. World Peace Foundation, forthcoming. ‘Soviet Union: German Prisoners of War following World War II’. Project on Mass Atrocity Endings. Wright, Tim. 2000. “Distant thunder: The regional economies of southwest china and the impact of the great depression.” Modern Asian Studies 34 (3): 697-738.